These Easy Peanut Noodles were one of my first recipes I posted when I started this blog – and is still one of my family’s favorites. There’s just something about noodles and veggies in a spicy peanut sauce that makes me want to eat the entire pan! And did I mention how ridiculously easy and quick this is to make? This is the perfect meal for those evenings when you want something tasty and quick. This recipe is so super easy, you’re going to laugh. You simply make the sauce, which comes together in minutes. Then you boil some water for your noodles. Then you add your noodles and a package of frozen veggies to the water and let it sit for about 10 minutes. Drain well and stir in your sauce. Bam. Done. The Sauce starts off with equal parts Low Sodium Soy Sauce and water. To that, I add lots of freshly chopped garlic, 1 tablespoon of Rice Vinegar (or apple cider vinegar), some ground ginger, and about 2-3 tablespoons of your favorite peanut butter. From this base sauce, you can add whatever flavor enhancements you want. I added some chopped green onion, a tablespoon of Hoisin Sauce, and some Sambal Chile Sauce. You could also add some lime juice and chile pepper flakes for more of a Pad Thai Sauce. The point is experiment and find what you like. The peanut butter will break apart so be sure and stir the sauce frequently over low heat until it’s nice and bubbly. For the noodles, I’ve used Thai Kitchen Stir Fry Rice Noodles – you simply boil some water, remove from heat, and add your noodles. They are done in about 10 minutes. I also like to use Udon Noodles – just leave out the spice packet. Feel free to use whatever you have on hand – in the video I used Brown Rice Pasta to make it Gluten Free. Birds Eye Steamfresh has some pretty inexpensive frozen veggies. My wife likes the broccoli & cauliflower combo while I like some carrots, snap peas, and water chestnuts in mine. Once your water begins to boil, you want to turn off the heat and add your noodles. This is the perfect time to add your veggies too. Don’t worry, the water is hot enough to cook them through, and besides most frozen veggies have been pre-cooked a little anyway. And if you cook them too long you’ll have mushy vegetables which no one likes. By adding them to the hot water they are perfect after 10 minutes – with just a bit of crunch. If you want to use fresh vegetables – (which I’m all for) – just remember they will need to cook longer. So maybe boil them separate until they are almost done and then add them in with the noodles and water to finish steaming. Frozen veggies are quick and easy though, and fairly inexpensive. Be sure and stay clear of any of those “pre-made” packages that include sauce. Their sauce is usually lots of high fructose corn syrup and msg. This sauce is much better – trust me. Speaking of sauce, it’s time to drain your veggies & noodles in a colander and then stir in the sauce. Guess what? It’s time to eat. The whole dinner can be prepped, cooked, and served in less than 30 minutes. Did I mention how easy this is? 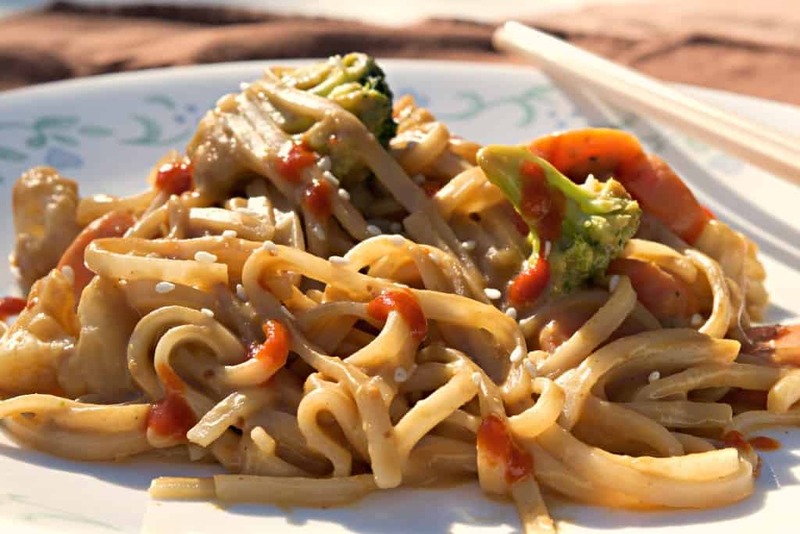 Easy Peanut Noodles - one of our first and most popular recipes. A thick garlicky peanut sauce with fresh veggies and asian rice noodles. The whole meal comes together in just minutes. Perfect for those busy evenings when you really don't have time to cook from scratch. In a small saucepan, combine all the sauce ingredients. Heat over low heat until bubbly. Bring about 1/2 a pasta pot of water to a boil. Turn off the heat and add the noodles and veggies. Let sit for 10 minutes and then drain completely. Made this tonight for my family and it was a hit. Has anyone made this with PB2 instead of peanut butter? I’m going to try it! We just did, and it was great. Bloody delicious. <3 I used normal spaghetti and next time I'd double or triple the amount of veg – but otherwise super good! I used rice ramen noodles. It was even better the next day as leftovers. Yum! I doubled the recipe but didn’t have red pepper flakes (might want to fix the typo in the recipe), and used crushed ginger instead of powder. Tasted right out of the pot and thought it was way too salty, but after mixing with a package of brown rice noodles and mixed veggies with bamboo shoots and water chestnuts, it was perfect! Another winner Chuck! On the video it says cook the pasta and in the remaining two minutes add frozen vegetables which doesn’t,t seem long enough. On the recipe it says to boil the water and add pasta and veggies for 10 minutes. I guess I can figure that out I can even microwave the veggies. Vegetables take six minutes in the microwave so I am curious as to how the veggies and pasta will be done. Stuart, I just made this recipe, it was perfect. If you use the asian style “rice stick” noodles (as I did), which are sort of clear looking in package, once you boil the water and turn it off, put in the noodles and dump in package of frozen veggies, put the lid on and let sit in the hot water (do NOT turn heat on or boil again), the heat from hot water “cooks” that type of noodle, and as Chuck mentioned above the recipe, the frozen veggies are always partly cooked Iblanched) before being frozen, so it doesn’t take much to get them fork tender but not mushy. The 10 minute soak in hot water was perfect for both the noodles and veggies! IF you use a different type of noodle, such the rice noodles that are more like spaghetti, which were used in the VIDEO, you cook the noodles first, then when almost done dump in the frozen veggies and CONTINUE simmering until veggies are fork tender – just a few minutes. Two different ways to get same results. OR, precook the veggies, and add to drained pot of noodles, mix in sauce. It all works – just depends on TYPE OF NOODLE how quickly it comes together. I love this recipe, SO SIMPLE = and the flavor is addictive! Well, it’s peanut butter – what more can one say?! YUMMY!